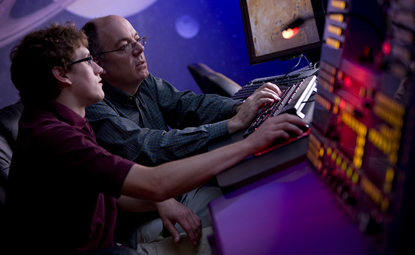 Students earning a minor in optics to complement another degree will study alongside faculty engaged in current research in freshly updated labs and with the latest equipment. You'll build an understanding and skills with the newest optical research tools. The university's international study interests, and a diverse faculty, will give you a global perspective on Earth and on space. You'll develop problem-solving skills as you're exposed to industrial and technological research. Faculty research programs in optical design and applications, theoretical nuclear physics, materials development and characterization, planetary science, extragalactic and stellar astronomy and Native astronomy. New optics and advanced optics laboratories in the new, $45 million Integrated Science and Engineering Laboratory Facility (ISELF) allow experimentation with lasers and fiber optics. NASA is expected to send a device designed by physics Professor John Harlander into orbit as part of a 2017 Explorer satellite mission. Notable alumnus: Chris Reyerson '96 is optical systems engineer for Arete Associates in Tucson, Ariz., who has worked on a prototype high altitude aerial surveillance system for the Office Naval Research among other projects.